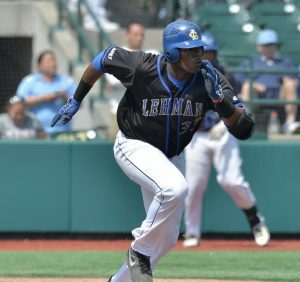 The Lehman College baseball squad defeated No. 23 Roanoke College 10-4 in Myrtle Beach, SC. It was the first time that a Lehman baseball squad ever defeated a nationally ranked opponent. The win, Lehman’s second of the season gives the Lightning a 2-6 mark. The Maroons fall to 12-3 and the loss snaps a four game winning streak. Jeff Ledesma set the stage for the Lightning in the first inning by smacking a two-out home run. A Matt Prevosti RBI single in the fourth doubled the Lightning advantage. Roanoke tied the game in the sixth with a pair of unearned runs. Pitcher Manny Velasquez kept the Maroons at bay as he pitched seven strong innings while striking out five. He left the game with the Lightning owning a 4-2 lead. A single by Nataneal Toribio in the seventh plated two more runs by the Lightning. Then Lehman opened the game up in the ninth as they scored six runs. RBI singles by Geraldo Rodriguez and Ledesma as well as a three run homer by Chris Lopez was all the insurance Ledesma needed as he came in to get his first save of the season. Ledesma also had three hits and three runs batted in. Lopez also added a pair of hits. The Lightning are back in action on Saturday afternoon at Old Westbury and then again on Sunday at St. Joseph’s (Brooklyn). Both are scheduled doubleheaders.